In upcoming versions, a Grid tab sheet in the data frame will display the same information as the Data Form tab sheet but in rows and columns instead of in controls. 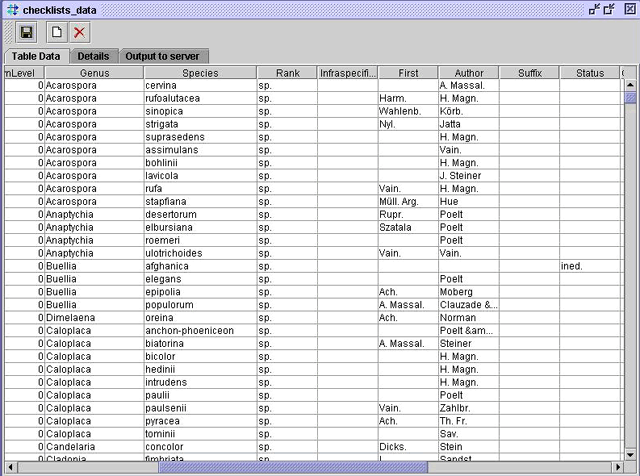 The columns of the Grid tab sheet will correspond to the top-level fields displayed in the Data Form tab sheet. This tab will let you view several records at once. Each row will display a separate record, and each column of that row is a field in the record. In some windows, the Grid tab sheet will have its own set of sub-tabs, which means that the user will be able to choose between information from two or more grid views. Each sub-tab will display records of a particular type. In upcoming versions, viewing and editing of data contents of more than one database will be enabled. This page (revision-1) last changed on 13:12 09-Oct-2006 by unknown.